Common in summer and uncommon in winter. Most common and widespread in southern California, but also breeds locally along the western edge of the San Joaquin Valley (McCaskie et al. 1979) and the eastern edge of the Sierra Nevada north through Inyo Co. Has nested in Monterey Co. since 1981, and occurs regularly in spring and summer in Siskiyou Co. (McCaskie et al. 1988). In winter, largely restricted to the southern coast, but also winters on southern deserts (Garrett and Dunn 1981). There is upslope movement after breeding and during fall migration (Garrett and Dunn 1981). 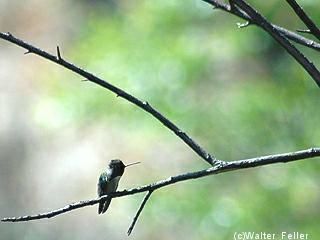 Occurs in more arid habitats than other hummingbirds in California. Primary habitats are desert wash, edges of desert riparian and valley foothill riparian, coastal scrub, desert scrub, desert succulent shrub, lower-elevation chaparral, and palm oasis. An uncommon transient on the Channel Islands (Garrett and Dunn 1981). Feeding: Various herbaceous and woody plants provide flower nectar; also takes small insects and spiders. In winter, exotic shrubs such as bottlebrush important (Garrett and Dunn 1981). Hovers when gathering nectar and insects. Cover: Mostly shrubs, but also trees, provide cover. Reproduction: Nest placed in a wide variety of trees, cacti, shrubs, woody forbs, and sometimes vines (Bent 1940). Nest height averages about 1.5 m (5 ft) (Woods 1927). Nest sometimes located close to water source, but more often well away from water (Johnsgard 1983). Water: No additional data found. Nectar provides much water. Pattern: Occurs primarily in arid scrub and chaparral habitats and in riparian edge. Activity Patterns: Yearlong, diurnal activity. Seasonal Movements/Migration: Arrives in southern deserts in late January, but not until mid-March on the coast and northern interior areas. Most desert breeders depart by late May, but numbers remain high on the coast until late September. There is upslope movement after breeding and during fall migration. Uncommon along the southern coast in winter. Home Range: No data found. Territory: Male has large territory, often 1 to 1.5 ha (2.5 to 3.7 ac) (Johnsgard 1983). Territory usually contains scattered tall perches and many food sources. Reproduction: Breeds from March through May in the deserts, and from April through July on the coast. Promiscuous; female nests in close proximity to others in favorable areas (Bent 1940). Usually 2 eggs laid, and 1 brood raised per season. Incubation lasts 15-18 days. Young altricial; fledge in 20-23 days. All nesting duties performed by female, as is usual in hummingbirds. Niche: As with other small hummingbirds, apparently taken infrequently by predators. Bent, A. C. 1940. Life histories of North American cuckoos, goatsuckers, hummingbirds, and their allies. U.S. Natl. Mus. Bull. 176. 506pp. DeSante, D. F., and D. G. Ainley. 1980. The avifauna of the South Farallon Islands, California. Studies in Avian Biol. No. 4. Cooper Ornithol. Soc., Lawrence, KA. 104pp. Ehrlich, P. R., D. S. Dobkin, and D. Wheye. 1988. The birder's handbook. Simon and Schuster, New York. 785pp. Johnsgard, P. A. 1983. The hummingbirds of North America. Smithsonian Inst. Press, Washington DC. 303pp. McCaskie, G., P. De Benedictis, R. Erickson, and J. Morlan. 1979. Birds of northern California, an annotated field list. 2nd ed. Golden Gate Audubon Soc., Berkeley. 84pp. McCaskie, G., P. De Benedictis, R. Erickson, and J. Morlan. 1988. Birds of northern California, an annotated field list. 2nd ed. Golden Gate Audubon Soc., Berkeley. Reprinted with suppl. 108pp. Woods, R. S. 1927. The hummingbirds of California. Auk 44:297-318. California Department of Fish and Game. California Interagency Wildlife Task Group. 2005. California Wildlife Habitat Relationships version 8.1 personal computer program. Sacramento, California. Very small, a mature adult grows to only 3 to 3� inches in length. The Costa's Hummingbird is fairly common in the arid brushy deserts and any nearby gardens of the Southwestern United States and the Baja California Peninsula of Mexico. Like all other hummingbird species the Costa's Hummingbird feeds on flower nectar and any tiny insects that it happens to find in the flower petals.